Port-wine stains are birthmarks that look like someone spilled wine on the skin. About 3 out of every 1,000 children are born with this pink-to-reddish mark. You'll see port-wine stains most often on faces, heads, arms, or legs. But they can appear anywhere on the body. These red marks are rarely harmful, and they usually aren't signs of any major health problem. The biggest concern is often whether a port-wine birthmark will upset a child or hurt their self-confidence, especially when they're a teenager. Port-wine stains are a kind of vascular birthmark, meaning that they're related to the skin's blood vessels. These birthmarks, including port-wine stains, are not caused by anything the mother does or doesn't do before or during her pregnancy. You can't prevent them. A port-wine stain happens when chemical signals in tiny blood vessels don't "turn off," and those blood vessels get bigger. The extra blood turns the skin red. Researchers found that port-wine stains start with the mutation of one specific gene. What causes this change in a developing baby's DNA still isn't clear. In about 3% of people who have a port wine stain on the face, this same mutation causes Sturge-Weber syndrome, a condition that affects the brain. People with this syndrome have seizures and eye problems. They may have weak muscles, migraines, and trouble learning. 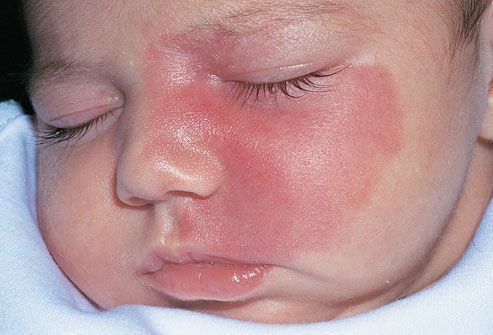 Unlike some other birthmarks, such as a "stork bite" or "strawberry," a port-wine stain grows as the child grows. The birthmark will last into adulthood. The color usually gets darker, turning purple or a deep red. The skin of a port-wine stain often gets thicker, and it may go from feeling smooth to pebbly. The birthmark shouldn't itch or hurt, and it shouldn't bleed. If it does, you should have it checked by a doctor. Sometimes, a port-wine stain gets drier than the skin around it, and using moisturizer will help. Port-wine stains around an eye or on an eyelid might cause glaucoma, which can lead to blindness. Your doctor can check the birthmark during a regular visit and let you know if there could be any problems. A port-wine stain, especially when it's large or on their face, might affect a kid's self-esteem. It might make others treat them differently, too. If you're concerned, ask your doctor about your options. For instance, laser treatments may help make port-wine stains smaller and lighter. The main thing you can do is talk with your child. Help them prepare for other people's questions and reactions. Explain that their birthmark is just a part of their body, like the color of their eyes or how tall they are. It has nothing to do with the kind of person he or she is. Great Ormond Street Hospital for Children NHS Foundation Trust: "Port wine stain information." MedlinePlus: "HealthDay: Researchers Pinpoint Cause of Port-Wine Stain Birthmarks." National Institute of Neurological Disorders and Stroke: "NINDS Sturge-Weber Syndrome Information Page." Duke Medicine: "Genetic mutation during development causes port-wine stains and Sturge-Weber Syndrome."